Who did you shut up, who did you trick? Would you even tell us what to wear? Which part of us should we give? How long will you stay silent? Whom did they made us responsible for? To whom did they sell us? Cuz I know it has an end. Ne ? O da mı aldattı seni be ? Eee ? Ne kaldı geriye ? What? She’s betrayed you, too, right? So then? What’s left behind? And now as if these weren’t enough, you gave yourself to love? Oh my! Say what you wanted to, say frankly! Whatever you wanna do, do it now! Come on hit me, hit me! Kolay geliyor değil mi herşey sana ? Everything comes easily to you, ain’t it? If you wanna bounce don’t stop, do it! * this is a cradle song: "Uyusun da büyüsün" that is [the baby should] "sleep and grow [strong]"
Ben miydim senin peşinden gelen ? Kadın mı sandın kendini birden ? Was it me who followed you? Did y’ think you were a woman not even knowing y’self? Despite sinking into despair, we resisted. We were thrown into a pit without stairs. We were thrown away, thrown away, thrown away! All dreams are in vain, we were thrown into a pit without stairs. Sendeki ben de ben değilim . 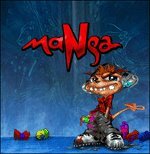 Special Thank You goes to mangafanclub.com Team Members (Ekip Üyeleri) and Ali Sarıgül for their help with idioms and slang, to Hadi Elazzi for his trust, to maNga for their crazy-loveable lyrics sometimes impossible to translate :D , for their trust and kind words. Your ROCK guys!